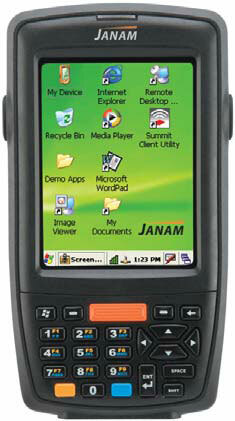 The Janam XM60+AM has been discontinued. No direct replacement is available. The Janam XM60+AM features an anti-bacterial coating as well as Summit's embedded Wi-Fi radio with unparalleled range, security, network performance and radio control. It also delivers Hi-Speed USB 2.0, a user accessible microSD card slot, more memory and increased battery capacity. The XM60+AM meets IP54 sealing requirements and withstands multiple 4'/1.2m drops to concrete across a wide temperature range.